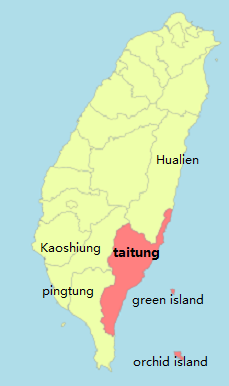 The name Taitung means 'Eastern Taiwan', it also known as 'Houshan' by many of the Taiwanese, meaning behind the mountains or back yard garden of Taiwan, runs along the south easat coasat of Taiwan. Total Area of 3,515 sq. km. rank 3th of 22 counties in Taiwan. Has a population of 224,470 people in Dec 2014, rank 19th of 22 counties with the density of 64 people per sq. km. rank 22th of 22 counties. (11) Yanping (12) Ludao / Green Island, (13) Lanyu / Orchid Island. In ancient Chinese mythology, there are 8 immortals had resided here for a long time, hence its name Basian (Baxian/ eight immortals). The mystery thing is that archeologists have found remains of a prehistoric culture approximately 30,000 to 50,000 years old in this area that make this a place worth visiting. These caves are formed by sea erosion million years ago, now being about 100meters above sea level, it was because of the tectonic movement, our land keeps and the caves become taller and taller. Basian Cave in Chinese means Cave of Eight Immortals, it does not mean there is only 8 caves, in actual facts it has more than 8, about 24 caves according to the 2011 press report. Shiyusan or 'Stone Umbrella', is an unusual rock formation which stretches out about 1km into the sea, a result of seawater erosion, the shape of the stone on the beach looks like an umbrella, giving it the name of 'Stone Umbrella'. The stone together with the nearby places of interested like the 'man's rock' and 'Sanxiantai' has make this spot become popular to the public. There are many temples in Taiwan for worship, but in Taitung there is a very interest and special place to worship, the Nanrenshi or known as Man's rock (Similar to the Japanese Kanamara Matsuri) - people are here to pray for marriage, for conceived, for prosperity, career and health. This Man's rock is a large stone of male genital with a human face on it, is the god 'Yung', in Chinese means origination. Sansiatai means 'Platform of the three immortals', it is said that three Chinese saints by the name of Tieguai -Li, Lu Dongbin and He-Xiangu was here and left three footprints - the 3 big rocks. Anyway, Sansiatai was a narrow and elongated cape into the ocean, when the neck of the cape was eroded by the tide, the rest of the cape was disconnected with the land and became an island. The eight cross-sea arch bridge that crosses over to the isalnd was designed in the shape of waves, once you crossed to the isolated isalnd you find that if still remained unaffected by human civilization and preserves well - nice to walk and explore around the small island. The beach in this area is awesome because it is entirely made up of round stone or pebble with clear water around, the overall scenery is incredible. A very interesting bridge which have two different designs at both ends the northern part of the bridge was built with arched designs and the southern part was merely supported with frames, and right below the center part of the bridge has a gigantic rock supporting the joins. No vehicles are allowed to be on the bridge now, is only for pedestrians only, by the eastern side of this old bridge you see a new bridge which is painted in red is to replace this old bridge for vehicles to pass through, Pacific Ocean and blue sky. Nearby this bridge, you can visit to the famous 'Donghe Baozi' (Seamed stuffed bun), well known in Taitung County is undoubtedly one of the must-try food. This quite beach somehow has attracted hundreds of international surer here once a year during November for the Annual Taiwan Open of Surfing competition. May be because of the charming 3km stretch of clean sandy beach and circling waves, which accumulated enough sands to connect the island with the seashore. Whatever it may be, if you are not the watersports lovers, visiting to the coffee shop off the roadside at the resting area, you too can overlook the panorama of the entire coast, it is scenic. An irrigation ditch that seems to violate the laws of gravity as the water seemingly runs slowly uphill along the canals. Many who visit this place are always curious about why this visual illusion happen? Both a natural and artistic coast, this little resting area is a great place for photos taking. Come, listen to the sound of waves, feel the ocean breeze and view the scenic mountain range and coastline, other than the natural beauty, there is lot of handicraft here too. The unique geological landscape of Siayeliou is a result of inverted sandstone and mudstone layers, come and take a look at an imaginative artist and skilled sculptor - what Mother Nature have for you. The amazing rocky formations are found at the seafront, such as shapes of mushroom, toufu and coral reef quit similar to one in New Taipei City Yeliu, but in a smaller scale, that what the name Siayeliou was given. The word 'Sia' means small. A place that organised 'dragon boat race', 'marathon' and 'ironman' race annually. Also known as 'Black Forest' for its immense dark Casuarina trees, this forest park has three lakes, namely, Pipa Lake, Huoshui Lake and Yuanyang Lake, and there is a bird watching station and bicycle path to go around the park. The Pipa Lake a beautiful natural lake formed by underground springs and tidal factors, has the shape of two connected water bodies, a small one and a large one looks like a Chinese lute. Yuanyang Lake was a piece of wetland, and after some improvement project, it becomes two lakes with a bridge in between, in Chinese Yuanyang means husband and wife, or you may translate it as lovers. Huoshui Lake is a man-made lake, looks like a super-size swimming pool, water in the lake is surprisingly blue in colour. The Seashore Park is next to Taitung Forest Park, the most eyes catching land marke is the paposogan or known as international land mark. This eyes catching land mark is made from rattan or Bamboo, it greets the first light of the morning due to its strategic location, you may come and listen to the wave rushing to the shore if you miss the morning sunrise. At night, its colorful lights shines as if looking forward to the vision of the world. Formerly a dormitory for railway workers, now turn into a place for visitors to enjoy live-music venue. Taitung has nurtured some of Taiwan's famous musicians and aboriginal people are renowned for having beautiful singing voices, so if you are here you should not miss this music village especially the night here will make your night a real wonderful, peaceful and relaxing one. This forest recreation area is a mostly primeval forest that consist of mahogany and camphor trees, and is rich in ecological resources, bounded by river bed and mountain ridges, steep slope makes it perfect for hiking, there are trails built in the dense forest. There is a small garden which is near to the entrance, you see plants with signs to explain the use of it of making into Chinese medicine or medicinal herb - very informative and educating. Jhihben you can see many hot spring spa around, if you have time you may try some of them, of course there are many hot spring everywhere in Taitung too. I will recommand 'Dong You Ji' hot spring spa if you wanted to have a hot spring bath in the area of Jhihben. Also known as Jean-Zen Mountain or JinZhenshan which gets its name after the increasing abundance of the JinZhen (Daylily). This beautiful and edible bright yellow Daylily harvest comes every August to September are spread across the mountain, setting at an elevation of 1,450meters above sea level, providing an ideal environment with low temperature and high humidity, perfect for growing daylilies. Beside the Daylilies, the apricot, peach and cherry trees blossoms also take turns to embellish the scenery. Other than appreciating the beautiful flowers and sceneries, try out the distinctive culinary of local Daylily gourmet is another way of appreciating the wonderful Taimali Mountain. The highest point of Beinan Township with about 410meters above sea level, was a military base during the Japanese colonial rule of Taiwan. Up the hilltop there is a viewing deck for a birds eye view of Beina River, Jili Cliff, Zhiben Hill, Dulan Hill, Taitung City, Central Mountain Ridgeline, Beinan Township and of course the Pacific Ocean at the far end, with this 360 degreed of far and board view sceneries is really magnificent. Is the first recreational area that combines medical herbs growth, biotechnology and tourism in Taiwan. The restaurant in the botanical garden is a good place to have dinner, you can try out all kinds of vegetable you may not see them before. The shopping center sell herbs, medicinal wine and local handicraft, one can also find a herb garden too. Nice place for relaxing during the evening, nice view of the Binan Township. Situated on a flat tableland with altitude ranging from 200 to 390meters, established since 1973 the longest history ranch in Taiwan. Having high quality soil and sufficient rain it produces good quality pasture, with these Chulu Ranch's milk is with super quality, you must try this milk when you are in Chulu Ranch or Taitung, you can't get them other than Taitung. The scenery is fabulous as usual with greenery and mountains it is a relaxing place to walk around, shopping of dairy products and have some other activities too. You can feed animals with leaves, go enjoy the sliding, horse ride, milking cows and etc. See and feel something difference, enjoyed the village environment, way of life of Bunun tribe, art and crafts, food and should not miss the Pasubutbut (the eight-part harmonic singing) at the performance hall. You will find many handmade products by the aboriginal in their shopping kiosk, good view at the cafe, huge wooden carving and a harmony community. Luye Gaotai is a piece of highland surrounded by high mountains, hills, terraces and plains with good soil, sunshine and fine weather has given this place a good land to produce extraordinarily fine flavor tea, open area for 'hot air balloon' and Paragliding activities are be able to see here. During April to October you can enjoy the amazing flight over the beautiful scenery of Taitung by Paragliding, June to September there is Taiwan International Balloon Fiesta and you can go high up with the hot air balloon. This hot spring spa is right below Luye Gaotai operates by the 'Farmers' Association', the place is safe and clean. Very low cost hot spring spa, NTS200 per head for a private room for two in the room, the big pool cost even lower, for people who do not like to soak in the pool you may try the leg soaking pool. Lunch box doesn't mean the box itself, is actually a package lunch with rice in the box. The museum shown the history of Chihshang lunchbox, and is good to go round the museum first, which is on the second floor before taking your lunch (the Chihshang lunchbox) at first floor. Chihshang has the best quality rice in Taiwan, if you like to bring them back home, you may purchase a small bag from the shopping area next to the lunch service counter. This lunch box business started in Chihshang's train station and later goes on to the train, travelers can take their lunch in train, that is why there is a train outside the museum, you can ty out the feeling of having lunch in the train too. What make this 'green road of paradise' so special is because this road is without any lamp post to be seen, surrounded by the pretty paddy fields and at the far end of the road you see mountain, give you the borderless feeling. It became famous now is because Mr. Takeshi Kaneshiro (Mr. Jin Tsheng Wu), the Japanese-Taiwanese pop-idol was here for the EVA air commercial. There is also a big photo fame standing on the entrance to this road for you to take your photo.